Shattered Sun have released a video for their new track Burn It Down exclusively with Metal Hammer. The single has been lifted from the Texas outfit’s upcoming album The Evolution Of Anger, which is out on July 21. 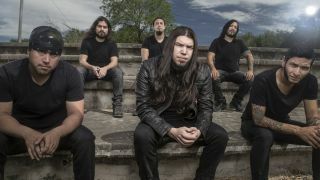 Guitarist Daniel Trejo decided to leave Shattered Sun in late 2015 prior to the band creating the album, leaving them at a loss. But his return to the lineup sparked their creativity, with Burn It Down the track that brought everything back into focus. Frontman Marcus Leal tells Metal Hammer: “We almost burned this band into the ground internally. Between all the things we have done over the years, things finally came to the surface. The band will head out on the road as part of the Vans Warped Tour from next month. Find their tour dates below. How Rage Against The Machine sparked a revolution – in the new issue of Hammer! TeamRock Radio is back. But after what happened, why have we kept the name?